Everything you need for being a wonderful cook in the kitchen! That's what's included in Lorrie Flem's Cooking Extravaganza bundle. As busy wives and mothers, sometimes the thought of getting meals on the table three times a day can be daunting. But Lorrie gives a whole lot of wonderful advice on how to do it and not pull your hair out getting it done. What's for Dinner Mom? Printed Book-I already reviewed this one and you can read that here. The book you receive in your bundle will be a signed copy! These books are really great. 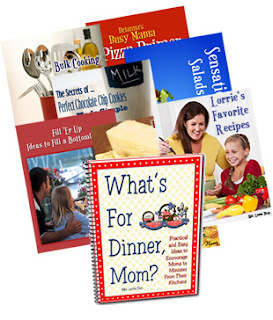 There are so many tidbits of information in here to help you learn more about cooking and filling your family's bellies. There is something for everyone to learn, as well as some really great recipes. I especially appreciate Lorrie's tips on how to fill up the bellies of children that seem to never be full. I have very, personal experience in this area. My children always seem to say, "I'm still hungry!" Lorrie also teaches how to get food on the table that is not only yummy, but healthy as well. I have to agree with Lorrie when she encourages you not to feed your children nutrition-less breakfast cereals! This bundle would make a great Christmas gift! If you do want to order it for Christmas, just be sure to do so by December 12 in order to receive your printed book in time. This is another great product from Eternal Encouragement that you are sure to enjoy! Lorrie is also doing a giveaway for the bundle, and you may enter at her blog. The winner will be chosen in December.